TWU Vic/Tas » BREAKING: CDC MEMBERS – It’s time for action. 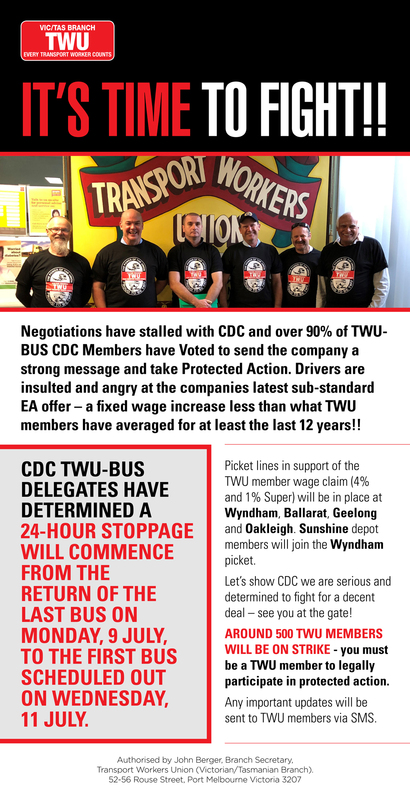 Negotiations have stalled with the multinational company after it tabled a disrespectful and insulting offer – rejected by your CDC TWU-BUS EA Committee. You should have received a text message alerting you to a 24-hour Fair Work Commission-approved stoppage to commence from the return of the last bus on Monday, 9 July, to the first bus scheduled out on Wednesday, 11 July. Strength and unity of TWU members will win a fair deal – and it has been a powerful start with a ballot for protected action counted on Monday ending up with over 90% approval for industrial action. Over 500 drivers will be taking action. You must be a TWU member to take legally join the stop work. CDC have offered a fixed wage increase that is less than what TWU members have averaged for more than the last 12 years. PICKET LINES WILL BE IN PLACE AT WYNDHAM , BALLARAT , GEELONG and OAKLEIGH. SUNSHINE DEPOT MEMBERS WILL JOIN THE WYNDHAM PICKET. Any updates will be sent to TWU members via SMS. IF YOU DID NOT RECEIVE THE TEXT – UPDATE YOUR DETAILS WITH THE TWU on 1300 727 614.